Holy guacamole! 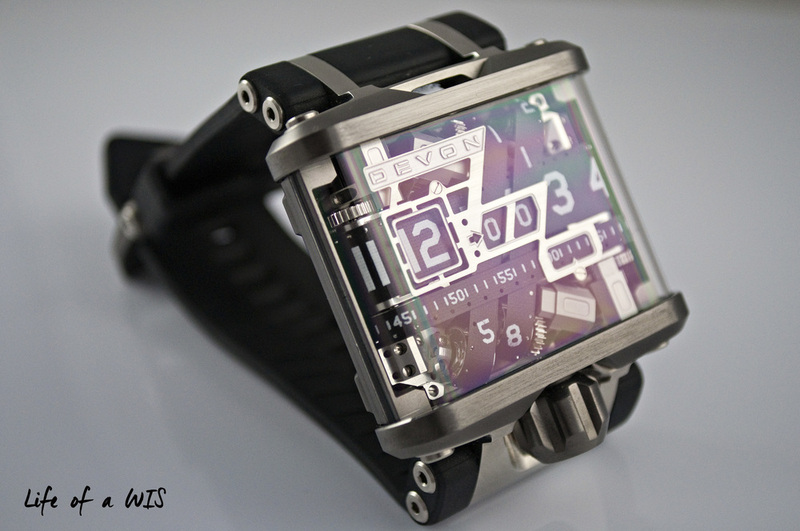 This is one huge, crazy looking, but insanely awesome watch. Obviously this watch is not for everyone... purists, conservatives, and traditionalists probably loathe this watch. But for the watch aficionados looking for something completely different and original, the Devon Tread 1 delivers and in a big way! And the cherry on top? This watch is completely designed and made in California, USA. Now how cool is that? Not the "designed" in California and made in China BS that we see often, but actually MADE in California. Now that is definitely something to be proud of. 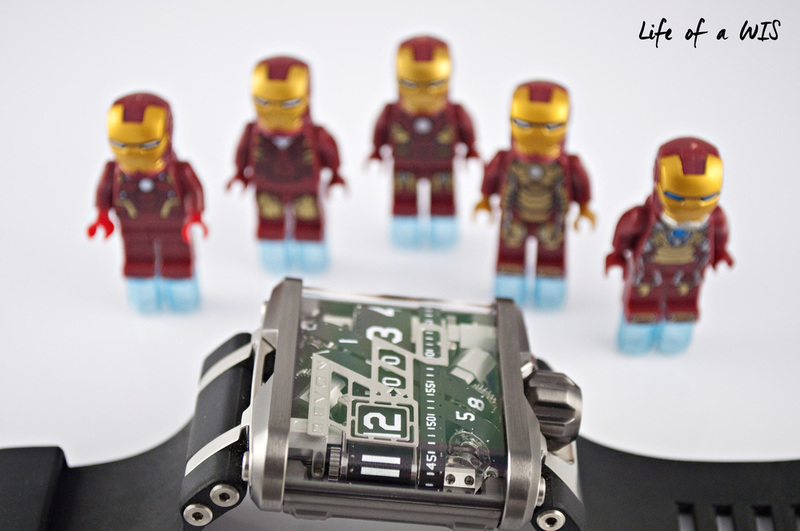 The perfect watch for Tony Stark? The ginormous case is made of 316L stainless steel with a polycarbonate glass. The polycarbonate glass actually accounts for almost half of the case, offering an unobstructed view of the mechanism inside. The case consists of five pieces with various finishes. On the Version C, the case has a satin finish for the most part and some polished surfaces. Some pieces are DLC coated to a titanium looking color. The most disappointing part of this watch is the polycarbonate glass. Though it has a scratch-resistant coating applied to it, this polycarbonate glass can and will probably scratch with time. And at this price range, I certainly expect a sapphire crystal. The good news is that Devon is supposedly releasing a sapphire crystal for the Tread 1 this year... no word on pricing yet, but given the size and shape, it will probably be quite substantial. On the rear, the company's name and watch model is engraved on a plate. Also on the plate, are the words "Made in California, USA". The scratch-resistant coating can be clearly seen on this photo. The dial is definitely the best part of this watch... the overall industrial, robotic, and futuristic look combined with the moving belts is just too cool. Literally, like nothing else out there. There are four microstep motors that move the time belts with surgical precision. Wink and you will miss it, that is how fast these belts move! The time belts are made of fiberglass reinforced nylon, making them only 0.05mm thick (2/1000 of an inch). This particular model had a dust particle right in the middle of the dial and the right hand side seconds belt indicator was slightly higher than the one on the left. Minor things, but I like to disclose all good and bad things in my reviews. Due to this, a point was deducted for these quality issues. The fiberglass reinforced nylon belts are only 0.05mm thick. The Version C comes on a soft black rubber strap with a brushed titanium color DLC coated tang buckle. The texture and look on the strap could be improved, lacks a bit of refinement. In order to be proportional to the case, the strap is also very massive. At its widest point, the strap measures 39mm (near the lugs) and then it tapers to 30mm at the buckle. The neatly designed buckle looks great and matches the modern look of the watch. 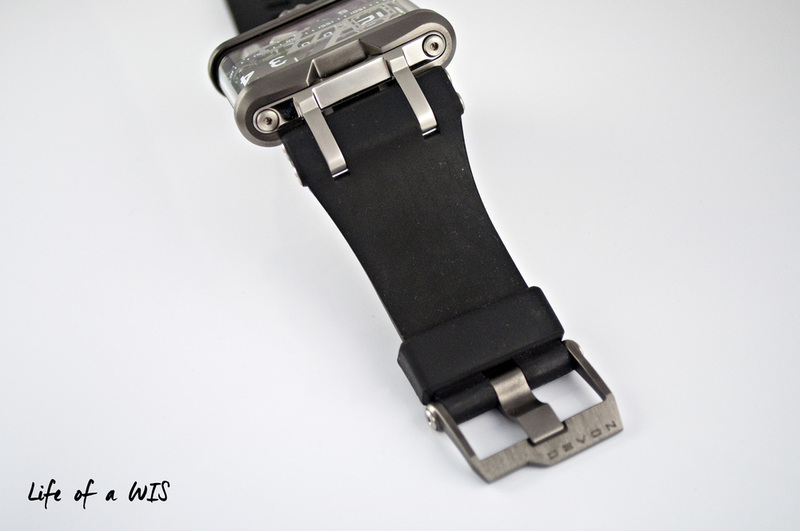 Due to the unique strap design, aftermarket straps will not work on this watch unless you get a highly customized one from a talented strapmaker. Big strap for a big watch. 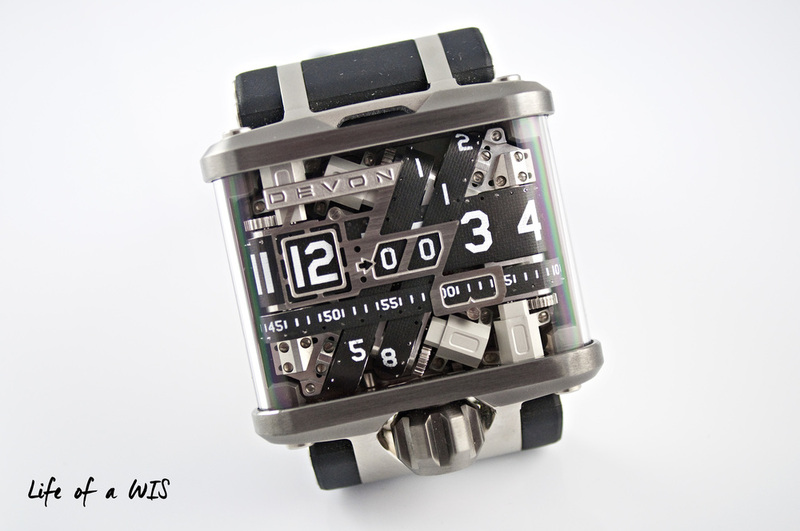 Despite not having a Swiss mechanical movement inside, this Devon is still a mechanical marvel on its own. Powered by a lithium-polymer rechargeable cell, the Tread 1 has a power reserve of two weeks when in silent mode. Charging it is as easy as it gets... simply place the watch back in its original box (which also serves as the charging dock) and the inductively coupled wireless charging system will get you back to full juice in just a few hours (8 hours for a completely depleted battery). The Tread 1 is equipped with a microprocessor that controls all the functions of the watch and ensures that the time belts are in the right positions. Devon claims that the Tread 1 is accurate to within one half second per day. Though I do love seeing the time belts move rapidly, the sound from the microstep motors is quite loud and distracting at times. Even in Silent Mode (more on this in Operation section below), the watch is still substantially loud when the time belts are moving. I wonder if the loud sound could be eliminated by moving the belts at a much slower rate... a reasonable compromise I think. Another concern? The durability on these microstep motors. Finally a watch box that is useful... it actually charges the watch too! During the day, the Tread 1 is extremely easy to read. So easy in fact, that even my two year old daughter can read the time thanks to the big digits on the time belts. But since it has no lume or light source, telling time in the dark is challenging. A manually activated LED light on the watch or lume on the numbers would have made this watch even cooler and perfectly legible at night. The big numbers on the time belts are easy to read during the day. 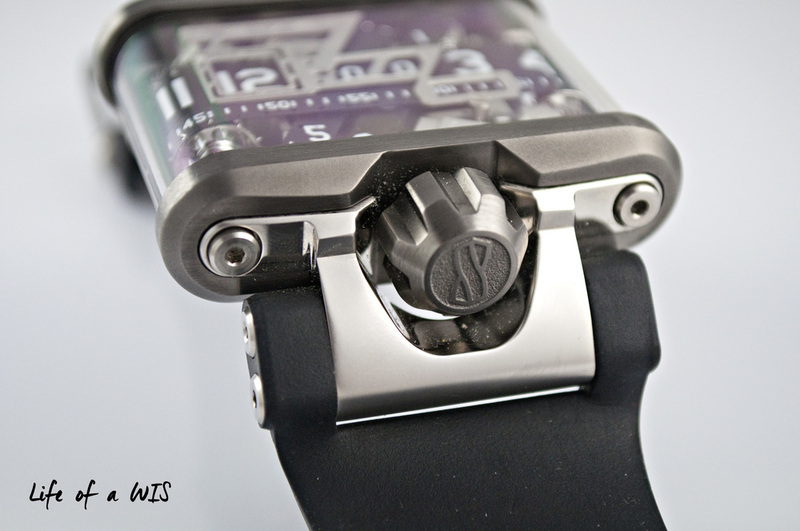 All functions of the watch are controlled via the oversized crown. After reading the instructions on the manual, I was impressed at how simple it is to actually operate this watch. The watch can run in two modes: Silent Mode and Normal Mode. To switch to Silent Mode, turn the crown counterclockwise and hold until the seconds time belt starts to move (same process to switch back to Normal Mode). In Silent Mode, the running seconds time belt is disabled and fixed at "00". This means that the "clicking" sound of every second is now eliminated, hence the name Silent Mode. But in addition to this, placing the watch in Silent Mode will extend your power reserve. Unfortunately, even in Silent Mode, the watch will still emit a loud sound every minute (when the time belts move). So if you are in a situation where this sound needs to be gone, you will have to turn the Tread 1 "off". To turn the watch "off" you only need to press the crown once (same process to switch back to "on"). This will move the hour time belt to "12", the minutes time belt to "00", and the seconds time belt will now display the amount of battery juice left. To adjust the time, turn the crown clockwise and hold until the seconds time belt start to move. Then, if you turn the crown clockwise again, the minutes time belts will move in increments of one minute. If you hold the crown, the minutes time belts will move a lot faster to your desired minute. To adjust the hour, it is exactly the same procedure as the minutes, except that you turn the crown counterclockwise. To exit the time adjusting mode, press the crown once and it will switch back to Normal Mode. I still cannot believe how incredibly easy this watch is to operate... absolutely brilliant design. During my time with the watch, all the functions worked perfectly and time was spot on. All functions of the watch are controlled via this oversized crown. Ironman worthy? I think so! 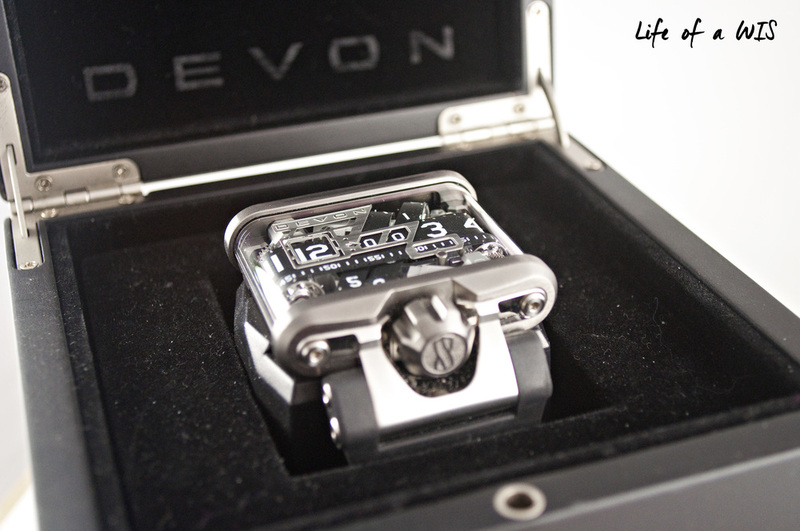 The unique and head-turning design on the Devon Tread 1 is also accompanied with a list of features: fiberglass reinforced nylon belts, a microprocessor with all functions controlled by the crown, four microstep motors that move the time belts rapidly but accurately, large polycarbonate glass which allows a clear view of the movement, wireless charging, two week power reserve, etc... My two biggest issues are the lack of a sapphire crystal and the low water resistance (no actual depth rating provided). Devon recommends that you take the watch off before showering or swimming. Unique lugs for a unique watch. Surprisingly, this beast of a watch is quite comfortable on my 6.5" wrist. The curved lugs, soft rubber strap, multiple holes on the strap, and the tang buckle all contribute to the overall comfort. The Tread 1 is one of the most comfortable watches I have worn (and biggest). The multiple holes on the strap makes finding the perfect fit a lot easier. The retail price on this Devon Tread 1 (Version C) is $18,500. For comparison purposes, the AP Royal Oak Offshore Diver in stainless steel is $19,000 and the Rolex Yacht-Master II is $18,750... but neither is as crazy looking as the Tread 1 (which could be good or bad, it depends on your tastes). I have never seen a Tread 1 for sale in the second hand market, so I cannot comment on its resale value. But at almost $20K, the retail price is a lot to swallow for a "battery operated" watch (plus there are a lot of nice watches available at this price range)... but when you take into account the amazing engineering, the intangible cool factor that this watch possesses, and the fact that you will probably never meet another person with the same watch... then it starts to seem a lot more reasonable. There is beauty within this beast.